DIBS has created a plug-in-module for Opencart 3.0 that offers you smoother integration. Before using our module, we recommend that you contact our sales department. We can ensure that you get the right payment method, currencies, and know which of our payment windows best suits your business. What is Easy for Opencart? Easy for Opencart is a plugin that extends Opencart, allowing you to take payments via DIBS’ new payment method, Easy. The extension is currently in beta. We would very much appreciate if you could report any bugs, and send questions or suggestions for changes to support@dibs.se. The Easy payment window integrates and displays directly in your checkout via an iframe solution. 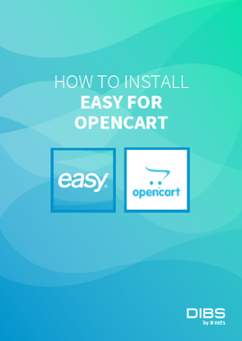 How do I install Easy for Opencart? First, upload the module package (Admin -> Extension Installer) OR copy the module files to your Opencart installation directory. You can apply modifications in (Admin -> Modifications) and click Refresh. Adjust your module settings in (Admin -> Extensions -> Payments -> Dibs Easy) and click Save. You need to enable HTTPS (install an SSL/TLS certificate) in your web store to get DIBS Easy to work. Apply modifications in (Admin -> Modifications) and then click Refresh. Set module settings in (Admin -> Extensions -> Payments -> Dibs Easy) and click Save. Enable ‘Test’ in (Admin -> Extensions -> Payments -> Dibs Easy). Currently allowed currencies are SEK, NOK & DKK. When you are finished with the installation and configuration, your web store needs to fulfill a number of criteria before DIBS can approve your store. Find the criteria on our site inspection website http://www.dibspayment.com/easy/siteinspection .